Standing 12 inches tall, this Achilles Statue depicts the Greek hero of the Trojan War. He is said to have been killed near the end of the war by Paris, with an arrow to the heel, his only point of vulnerability. A replica of the famous ancient Greek statue, this Aphrodite of Milos Statue (or Venus de Milo) is made from cold cast resin with a bronze finish and measures 11 inches tall. The original was made between 130 and 100 BCE, and depicted Aphrodite, the Greek goddess of love and beauty (Venus to the Romans). Made from hand painted resin, this Athena Statue measures 11.75 inches tall. White marble finish with gold painted detail. Measuring 7.75 x 7.75 x 17.25 inches, this Atlas LED Night Light is made from cold cast resin with a bronze finish. AC power cord measures approximately 36 inches. A replica of the famous ancient Greek statue, this Aphrodite of Milos Statue (or Venus de Milo) is made from cold cast resin with a bronze finish and measures 10.75 inches tall. The original was made between 130 and 100 BCE, and depicted Aphrodite, the Greek goddess of love and beauty (Venus to the Romans). The Bronze Great Rite Statue depicts the Forest God, or Horned One, and Moon Goddess join their magical energies as they embrace in the most sacred ritual. Our Bronze Brigid Statue depicts Brigid, Goddess of wells, springs, fire, and fertility. The Celtic Goddess Brigid is beloved as the muse of poetic inspiration and the mistress of the healing arts. 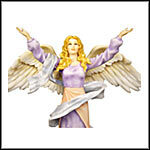 Our Brigid Statue depicts Brigid, Goddess of wells, springs, fire, and fertility. The Celtic Goddess Brigid is beloved as the muse of poetic inspiration and the mistress of the healing arts. Our Bronze Cerridwen Statue depicts Cerridwen, Mother of Taliesin. Cauldron of Inspiration. Great earth goddess associated with the eternal cycle of life, death, and rebirth, worshiped at harvest time. Our Bronze Danu Statue depicts Danu, Goddess of flowing rivers. Mother of the ancient Celts. Danu is thought to be the great mother of the race of the Tuatha De Danaan, the ancient tribe of the Celtic people. Brigit is the Goddess in the form of a lovely young Gaelic woman in Celtic garb gazing confidently into the living flame cupped in her hand. Brigit is the Goddess. Healer. Alchemist. Queen. A lovely altar piece for daily inspiration. Reclaim the power of three! Made from cold cast resin with a bronze finish, this Baldr Statue measures 9.5 inches tall. Often interpreted as the Norse god of love, peace, forgiveness, and justice, Baldr's death is considered to be the beginning of the destruction of the gods at Ragnarök. Made from cold cast resin and hand painted, this Gatekeeper Statue measures 12 inches tall. The Great Rite Statue depicts the Forest God, or Horned One, and Moon Goddess join their magical energies as they embrace in the most sacred ritual. The Bronze Kali Statue depicts the Fierce Mother. When we have need of her, Kali descends as the powerful warrior goddess to slay the demons that threaten her devotees. Diana the Huntress stands with her Stag companion. Confidently skyclad, her moon circlet and pendant proclaim her connection with the moon cycles. Our Bronze Medb Statue depicts Medb, Intoxicating Queen of Desire. She is thought to be the progenitor of Maab, the English queen of the fairies. Our Danu Statue depicts Danu, Goddess of flowing rivers. Mother of the ancient Celts. Danu is thought to be the great mother of the race of the Tuatha De Danaan, the ancient tribe of the Celtic people. Our Bronze Morrigan Statue depicts Morrigan, Goddess of destruction and fury, a true warrior spirit. She uses her sexual power to manipulate and inspire fear in her enemies, and reveled in her lust for blood. Ceridwen, the Celtic goddess of knowledge and creativity, stirs a potent magic in her bottomless cauldron. A primal force of shadow and light, her magic draught bestows inspiration upon all who seek their muse. Made from hand painted resin, this Cerberus Statue measures 8 inches long. In Greek mythology, Cerberus is the multi-headed "Hound of Hades" who guards the gates of the Underworld. Depicted here with his three-headed guard dog Cerberus, Hades became ruler of the Underworld as his brothers Zeus and Poseidon became rulers of the air and the sea, respectively. Measuring 6 x 5.75 x 7.5 inches, this Heracles and the Nemean Lion Statue is made from cold cast resin with a bronze finish. A hero of Greek mythology, Heracles slayed the Nemean Lion as the first of 12 labors assigned to him by Eurystheus. Made from cold cast resin with a bronze finish, this Gaia Statue measures 5 x 2.75 x 8.75 inches. In Greek Mythology Gaia (or Gaea) is the personification of Earth. The ancient Greek god of the grape harvest, wine, and ritual madness, our Dionysus Statue is made from cold cast resin with a bronze finish, standing 11 inches tall. His Roman counterpart is Bacchus. This Hanuman Statue, hand painted and made from cold cast resin, measures approximately 9.75 inches tall. A devotee of Rama, Hanuman is a central figure of the Ramayana. Made from cold cast resin and painted to look like aged bronze, this Buddha Head Statue measures approximately 6.5 inches tall. Perfect for enlightening your shelf or dresser. Our Moon Pentacle Stone Magnet features a pentacle, carved with Celtic knotwork as well as traditional Celtic swirl patterns. It is a symbol of Earth and Prosperity as seen in the tarot. Our Maiden, Mother, & Crone Wall Plaque features the three stages of a woman's life and depicts the Goddess in her three aspects as Maiden, Mother and Crone. The Triple Goddess represents the divine feminine's connection to the cycles of nature. Divine Feminine. Beauty. Power. Wisdom. The cycles of Life and Nature. The Lalitha Statue depicts She who plays. Shri Yantra -- The Red Flower. Merciful Mother of Enlightenment. Arianrhod is a goddess of challenge and transformation. Her name translates to the silver wheel, which we equate with the moon and stars and their cycles of change in the heavens. Our Medb Statue depicts Medb, Intoxicating Queen of Desire. She is thought to be the progenitor of Maab, the English queen of the fairies. The four arms of the elemental cross reach to the four seasons, the circle encompassing all in its celestial arc. A wealth of detail shows a variety of motifs for the seasons-plants, animals and weather. Our The Laidly Relic Wall Mount is the distilled essence of ancient primal fury and chaos was harnessed to become the ultimate reptilian guardian of hearth and home. This beautiful dragon wall mount is cast in high quality resin. Made from cold cast resin with a bronze finish, this Odin Statue measures 10 5/8 inches tall. Riding his flying, 8 legged steed Sleipnir across the sky and into the Underworld. Made from cold cast resin with a bronze finish, this Skadi (Skaði in Norse Mythology) Statue measures 9.75 inches tall. Skaði is associated with bowhunting, skiing, winter, and mountains. Made from cold cast resin with a bronze finish, this Thor Statue measures approximately 10 inches tall. Thor is a Norse god associated with thunder, lightning, storms, oak trees, strength, and the protection of mankind. Made from cold cast resin with a hand painted finish, this Lakshmi Statue measures 6.25 inches tall. Lakshmi represents good luck, prosperity, and happiness in Hindu culture. Made from cold cast resin with a bronze finish, this Money Frog measures 4.25 x 3.25 x 3.25 inches. Made from cold cast resin, this Meditating Buddha Candle Holder measures 8.5 inches tall. Buddha peacefully meditates while holding a lotus flower in his hands. Holds one tealight. Poseidon, Greek god of the sea, earthquakes, and horses, is depicted here in cold cast resin with a bronze finish. This Poseidon Statue measures 9.75 inches tall, complete with his trusty trident. King of the gods of Mount Olympus, this Zeus Statue measures 11.25 inches tall, made from cold cast resin with a bronze finish. In Greek mythology, Zeus is god of lightning and thunder, as well as law, order, and justice. Made from cold cast resin with a bronze finish, this Nemesis Statue measures 6.25 x 5 x 11.25 inches. In Greek mythology, Nemesis was the spirit of divine retribution against those who succumb to hubris. Measuring 7.5 x 2.5 x 10 inches, this Three Graces Statue is made from cold cast resin with a bronze finish. In Greek Mythology, a Charis (or Grace) is one of three or more minor goddesses of charm, beauty, nature, creativity, and fertility. In ancient Greece, Hestia, the oldest of the Olympian gods, was the virgin goddess of the hearth, architecture, and the family. She received the first offering at every sacrifice in the household. This Hestia Statue is made from cold cast resin with a bronze finish and measures 12 inches tall. Measuring 10 x 7 x 10.5 inches, this Neptune Statue is made from cold cast resin with a bronze finish. Roman god of freshwater and the sea, Neptune is the counterpart to the Greek god Poseidon. Depicted here with a mermaid, sea creatures, and his trident, he was also considered god of horses. This Satyr Statue measures 9.75 inches tall and is made from cold cast resin with a bronze finish. Satyrs, in Greek mythology, are the companions of Dionysus with horse-like features. In Roman mythology, they are similar, but with goat-like features. Our Satyr is depicted playing its pipe upon a tree stump. Measuring 5.75 x 4.75 x 8 inches, this Vishnu Statue is made from cold cast resin with hand painted details. Vishnu is regarded as the preserver or protector in Hinduism. Measuring 5 x 4.5 x 8 inches, this Shiva Statue is made from cold cast resin with hand painted details. Shiva is God of Gods in Hinduism, limitless, unchanging, and formless. He is the patron of yoga and art. This Medusa Statue is made from cold cast resin with hand painted details. Measures approximately 8.5 inches tall. We would advise against making eye contact with this famous Gorgon. This Mother Maiden Crone Candle Holder measures approximately 4.25 x 3.75 x 10 inches. Made from cold cast resin with a hand applied faux stone finish. This Saraswati Statue, hand painted and made from cold cast resin, measures approximately 6 x 4.5 x 8 inches. The Hindu goddess of the arts, music, learning, and wisdom, she is shown here with her veena and swan. This Rama Statue, hand painted and made from cold cast resin, measures approximately 10 inches tall. An avatar of the Hindu god Vishnu, Rama is shown here with his bow and arrows and sword. He is the subject of the epic Ramayana.